People are using new pharmacy services through GP practices to help them with their healthcare, medicine use and getting prescriptions. Our May People’s Network was split into two sessions where participants were invited to join us for one or both of them. with health and the way that medicines are used. This is called Practice-Based Pharmacy. We asked if people have used this service at their doctor’s surgery, what people think and has it made a difference. After lunch we invited people to talk about a service that allows you to order your prescriptions and get medicines advice over the telephone. This service is called Prescription Ordering Direct – or POD and helps people who do not use the internet and may struggle to get to their practice to order prescriptions. POD is available in the following surgeries: LINKS Medical Practice, AW Surgeries, Halesowen Medical Practice, High Oak Surgery, Wordsley Green Health Centre, Three Villages Medical Practice, Waterfront Surgery and Central Clinic. We invited people who are registered with one of these surgeries and use Prescription Ordering Direct to invite you to join us and share their experiences. The conversations that took place will contribute to a report about pharmacy services for Dudley Clinical Commissioning Group. 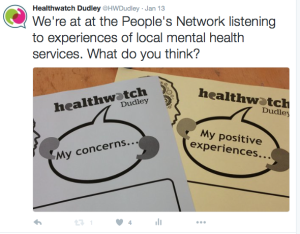 Dudley and Walsall Mental Health Partnership NHS Trust launched their new 24-hour Assessment Service in May last year and Healthwatch Dudley was asked by the Trust to find out what people think. Did the system work for you when you tried to get help? If you needed urgent help did you get a timely response? Did you feel listened to and cared for while you were being referred to other services? Do you think that the new 24-hour Assessment Service is making a difference to you or the people you care for? 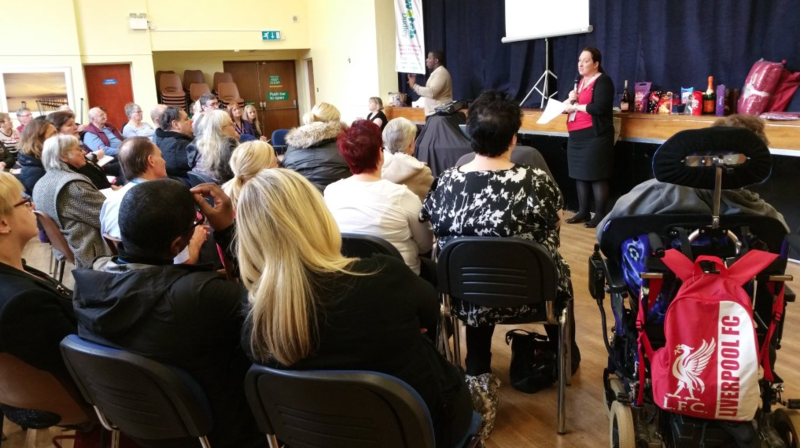 People’s Network events are usually for everyone but this special event was only open to people who access services provided by Dudley and Walsall Mental Health NHS Partnership Trust and the people who support them in an unpaid capacity. A report is currently being compiled for the Trust. Plans are underway to transform health and care in Dudley borough. Find out what this might mean for Dudley and join the conversation. Dudley Clinical Commissioning Group (CCG) has been working with partners to redesign health and social care across Dudley borough. A Multi-Specialty Community Provider (MCP) is one way suggested by the NHS to develop local services and Dudley was chosen as one of the first areas to introduce this new approach. Over the last three years Dudley CCG has been working on this and is in the process of identifying a new organisation that will join up some physical health, mental health, social care and voluntary sector services in Dudley borough. The bidders are required to make their final submission by 23rd April 2018 and are very keen to include your views in the development of their plans. Dudley CCG is part of the NHS and is responsible for planning and paying for all of the local health services with a £458 million budget that it receives from central government. The vision for Dudley borough is for it to be a place where people with dementia and those who care about them can receive the right services, in the right place, for the right need and in a timely, responsive and non-discriminatory way. 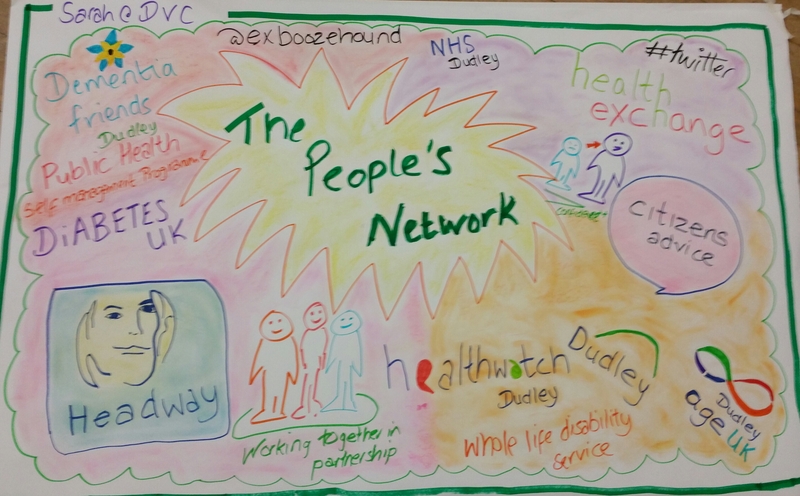 At our November People’s Network we talked about dementia, the support that people in Dudley can access and what this should look like as the needs of our society change and grow. At this event members of the People’s Network were invited to take part in an important discussion about how we use chemists, what works well for us and what improvements we would like to see in the future. Our conversations contributed to a review of pharmacy services in Dudley borough. 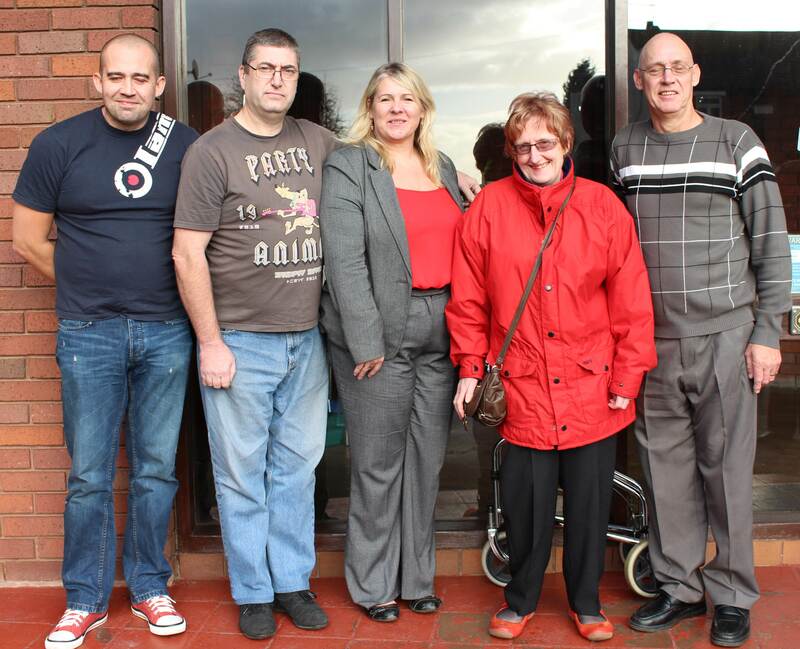 Dudley Council commissioners have contracts with Care at Home providers for 18,000 hours of home care each week. 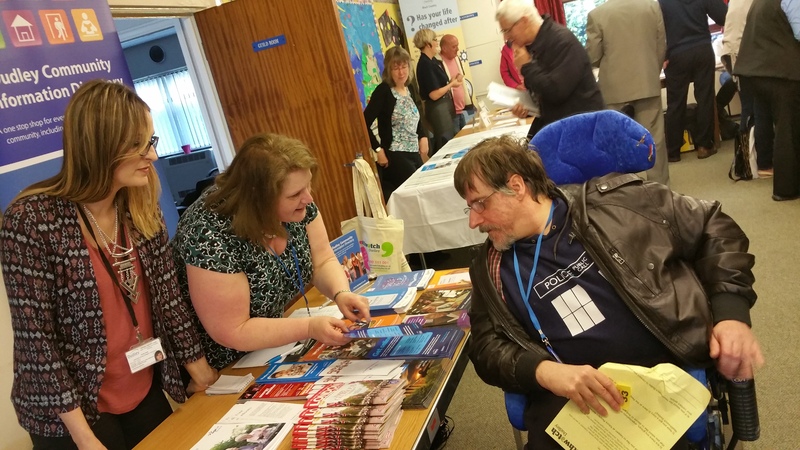 We were asked if we could bring people together to meet decision makers to listen and learn from their experiences, ideas and suggestions about how future Care at Home services are planned and provided. Home life, family and our experiences all have a big impact on our health and wellbeing – but what does this mean for people who plan health and care services? Dudley Health and Wellbeing Board asked the People’s Network to help them identify and set priorities for the future. The conversations that took place helped to steer a Health and Wellbeing Board development session and are helping to shape the new plan. The Dudley Health & Wellbeing Board is responsible for the health and wellbeing of all residents in Dudley borough. Using local evidence, it works to help identify the needs of local residents, improve efficiency, secure better care to improve health and wellbeing as well as tackle health inequalities across the borough. Peer support is people power! It happens when people come together to share skills or to discuss their experience of an important issue, illness or health condition or by giving each other emotional support. Conversations were fed into an event that took place the following day in Dudley, where voluntary and community groups explored how local decision makers can better support improve health and wellbeing as well as tackle health inequalities across the borough. To celebrate Self Care Week our November event shone another spotlight on local health and wellbeing services. 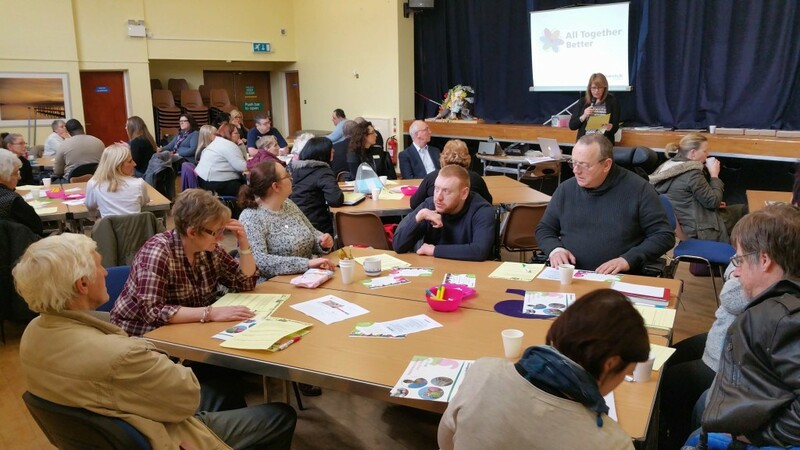 The network was invited to come together to find out about local service that keep us healthy and well, meet some of the people who deliver them and share experiences of accessing health and care services in Dudley borough. Our event involved guest speakers and a market place to share information about local services that can help us to take care of ourselves and each other. Dudley Clinical Commissioning Group (CCG) has been working with partners to redesign health, social care and voluntary sector services across Dudley borough. A new way of working is being planned that will join up physical health, mental health, social care and voluntary sector services through the development of GP practice based teams. A formal public consultation was launched in July on how a new ‘Multi-Specialty Community Provider’ (MCP) is being developed to deliver services that are currently provided by GP practices, nurses, community health and mental health services, community based services such as physiotherapy teams, relevant hospital specialists and others who provide care in the community. Healthwatch Dudley invited people from Dudley CCG to explain what is being proposed and there was a question and answers session so that views could be shared to influence how the new Dudley MCP will be organised. Dignity can mean different things to different people.It can be about respect, privacy, autonomy and self-worth and being treated as an individual. It can be hard to explain what dignity is, however you will probably know when you haven’t been treated with it. 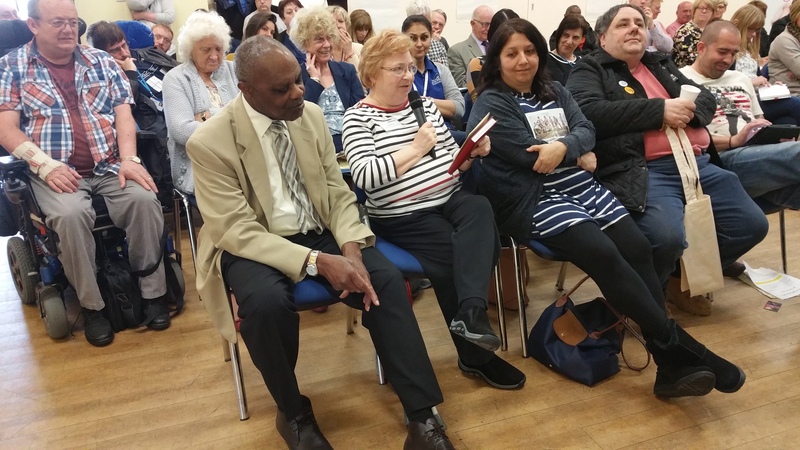 At our July event, we invited guest speakers to share what dignity means to them and everyone took part in group discussions, shared personal experiences and views that will influence an new dignity pledge for Dudley borough. You asked for another ‘spotlight’ event as you enjoyed finding out information in our marketplace and hearing about local support services. Our guest speakers shared information about diabetes, mental health support and managing health conditions. Spotlight events are a great place for people to share their own experiences of health and care and we were delighted that so many people took part. For our March event we sent out an invitation to take part in Dudley’s ‘biggest ever conversation about health and social care’. 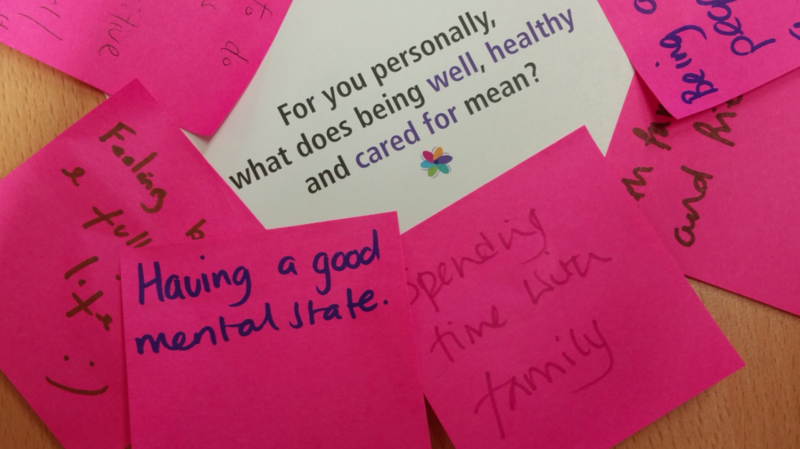 We asked the question, “What does being well, healthy and cared for mean?” and shared ideas about how communities are coming together in creative ways to improve their health and wellbeing. Mental health was the focus of our January People’s Network as this important issue had been discussed at every People’s Network event and tied in with an upcoming Care Quality Commission Inspection of Dudley and Walsall Mental Health Partnership NHS Trust. The event included guest speakers from local services including Dudley Mind, Rethink, Dudley Counselling Centre and the Exboozehound group for men. Following this a discussion took place about how safe, effective, caring, well led and responsive attendees find local mental health services to be. Feedback from the day was anonymised and shared with the Care Quality Commission to inform their inspection report which can be viewed here. The People’s Network asked for more information about adult social care services and the charities and organisations that support and complement the Dudley Council offer. The November People’s Network provided a marketplace for services and groups to showcase what they do. Lots of networking took place and guest speakers shared how they are supporting vulnerable people by sharing case studies and stories from people who access their services. Our September People’s Network gave participants the chance to feed back to decision makers about what they felt priorities were for adult social care in Dudley borough. The themes for the next two people’s network events were also set. Our July People’s Network focussed on people who care for a friend or family member or support someone who does. The conversations that took place were shared with the Carers Alliance and will help to shape the the future of support for carers in Dudley borough through a new carers strategy. Our May People’s Network included presentations, workshops and discussions about how technology is supporting information giving in Dudley borough. The event included presentation about Community Information Points and Champions, Telecare and Dudley Community Information Directory. Participants were also invited to test a new website that can be used to order social care products to make life easier for local people. 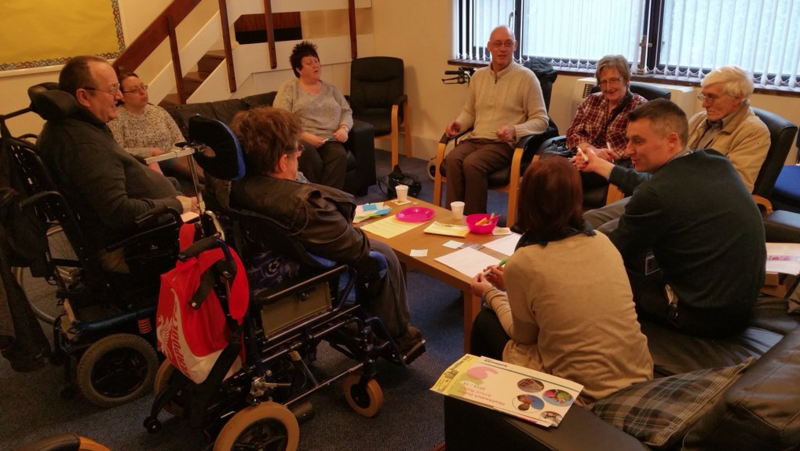 The group of people who shared their views about the Local account have decided to grow their group into the new People’s Network for people who are passionate about adult social care in Dudley borough. A launch event took place on 11th of March between 11am & 1.30pm where people were invited to plan the focus of the next two network events. The network is for people who access or provide services or those who care for people who do. Everyone is welcome. Healthwatch Dudley is passionate about making sure that local voices are listened to by people who make decisions about health and social care.